Several faculty from the Department of Atmospheric Sciences and the Department of Geology investigate climate and climate change from a variety of perspectives, including past IGPCC members Prof. Don Wuebbles and Prof. Michael Schlesinger. Determining the extent to which the earth will warm on local and global scales is one of humanity's most urgent challenges. Looking back at past climates, the science of paleoclimatology creates context for understanding recent climate change and aids predictions of future climates. Looking forward at predicted climates allows scientists to collaborate with policy makers to mitigate detrimental outcomes. Check out the faculty profiles below to learn more about the climate change research conducted in SESE. 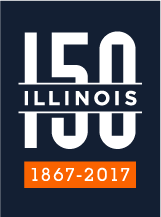 The University of Illinois also houses numerous researchers, across multiple disciplines, dedicated to unraveling the secrets of our past. To learn more, visit our page dedicated to Paleoscience at the University of Illinois and stay tuned for future Phillips Lectures.